Diplomatic reception, West Germany, 1961; the Danish ambassador wears a red diplomatic uniform, the British ambassador a dark one. Up until the 18th century, diplomats (who usually belonged to the high nobility) wore their own court clothing to solemn occasions. Diplomatic uniforms were first introduced by France in 1781 and widely adopted by other European nations around 1800 in the course of administrative reforms undertaken as a response to the French Revolution and the Napoleonic Wars. In several countries, diplomatic uniforms were among the first civilian uniforms to be adopted. 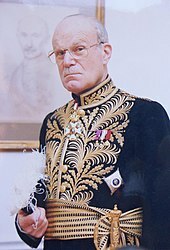 Apart from saving diplomats (who now increasingly were not independently wealthy) the expense of maintaining a full court wardrobe, diplomatic uniforms served to emphasize the importance of the office and to deemphasize the person of its holder. Following the Meiji Restoration, the Dajō-kan released an edict on December 12, 1872, implementing regulations for the uniforms of civil officials and nobles, and issuing another edict on December 29 of that year regulating their proper wear. Three of the highest subcategories of civil officials were allocated specific court (diplomatic) uniforms: Imperial appointees (勅任官, chokuninkan), non-Imperially appointed senior officials (奏任官, sōninkan), and junior officials (判任官, hanninkan). On December 4, 1886, the designs of the court uniforms for civil officials were modified, but the designs for junior officials were not updated; due to the high cost of formal court dress, junior civil officials wore standard white tie court dress from then on. :176 On March 2, 1908, an Imperial edict established substitute court uniforms for diplomats dispatched to the tropics or very hot areas. Later, on September 29, 1926, another Imperial edict established alternative court uniforms and court dress, consisting of white tropical tunics, for Japanese officials in the South Pacific. The standard diplomatic uniform for officials in the three primary categories of the Imperial Japanese diplomatic service (chokuninkan, sōninkan and hanninkan) consisted of a black wool frock coat with gold-embroidered pauwlownia flowers (chokuninkan) or buds (sōninkan and hanninkan) with gold-embroidered paulownia leaves and ornamentation in patterns and in areas of the coat corresponding to the respective category. The uniform coat was worn with a wool vest in black or dark gray (chokuninkan and sōninkan) or in navy blue (hanninkan), with wool trousers in the same colors, again corresponding to category. All officials in the three primary categories wore a plumed bicorne hat with their uniforms, with the right side of the hat embellished according to category. Civil officials below the hanninkan level used standard white-tie court dress. However, the higher-ranking among these affixed symbols of their ranks to each cuff. Diplomats who were also peers (kazoku) could also wear the established uniforms corresponding to their rank, as could former or serving officers of the Imperial Japanese military. Japanese court and diplomatic dress was abolished after World War II with the abolition of the pertinent Imperial Household Agency edicts (effective May 2, 1947) and the pertinent Dajō-kan edicts on July 1, 1954, respectively. In response to what was perceived as the excessive ostentatiousness of some of these individualized uniforms, Congress banned diplomatic uniforms altogether in 1867, by passing a resolution forbidding diplomatic officials to wear "any uniform or official costume not previously authorized by Congress". This caused some discomfort to American diplomats, who now had to appear "underdressed", in evening dress, to official functions. In 1910, Theodore Roosevelt attracted considerable attention when he was one of the few foreign representatives at the funeral of King Edward VII who was not in civil or military uniform. ^ a b c d e f g h Hackspiel-Mikosch, Elisabeth (2005). "Uniforms, diplomatic". In Steele, Valerie (ed.). Encyclopedia of Clothing and Fashion. 3. Thomson Gale. pp. 362–364. ISBN 0-684-31394-4. ^ "The new Spanish ambassador in the Vatican presents his credentials to the Pope". Retrieved 3 June 2016. ^ "New Danish Ambassador in Great Britain". Retrieved 3 June 2016. ^ Dajō-kan Edict No. 339 of December 12, 1872. Taireifuku oyobi tsūjōreifuku wo sadame, ikan wo saifuku to nasu nado no ken (大礼服及通常礼服ヲ定メ衣冠ヲ祭服ト為ス等ノ件). View here. ^ Dajō-kan Edict No. 373 of December 29, 1872. Taireifuku oyobi tsūjōreifuku chakuyoubi no ken (大礼服及通常礼服著用日ノ件). View here. ^ Osakabe, Yoshinori (April 2010). 洋服・散髪・脱刀 : 服制の明治維新 [Western Clothes, Cut Hair, No Swords: The Meiji Restoration of Clothing] (in Japanese). Kodansha Ltd. ISBN 978-4-06-258464-7. ^ JACAR (Japan Center for Asian Historical Records) Ref.A07090081700. 改定文官大礼服制表並図・勅奏任官 [Independent Documents: Tables and Illustrations on Revised Ceremonial Dress Code for Civil Officials: Officials under Imperial Appointment and Officials Appointed with the Emperor's Approval] (in Japanese). ^ a b Lyadov, P.F. "Protocol and Etiquette". Russian Embassy in Chile (originally published in DIPLOMAT). Archived from the original on 3 October 2011. Retrieved 5 September 2010. ^ a b c Israėli︠a︡n, Viktor Levonovich (2003). On the battlefields of the cold war: a Soviet ambassador's confession. Penn State Press. pp. 20–21. ISBN 978-0-271-02297-0. ^ "Diplomatic Uniforms at the Holy See". Foreign & Commonwealth Office. Retrieved 2 June 2016. ^ a b c "Diplomatic and Consular Uniforms". ^ a b c Schuyler, Eugene (1886). American Diplomacy and the Furtherance of Commerce. Scribner's. pp. 62–63 (2009 reprint). ISBN 978-1-150-20435-7. ^ "History of US Navy Uniforms". ^ Plischke, Elmer (1999). U.S. Department of State: A Reference History. Greenwood Press. pp. 148–150(1999 edition). ISBN 978-0-313-29126-5. This page was last edited on 27 March 2019, at 08:01 (UTC).